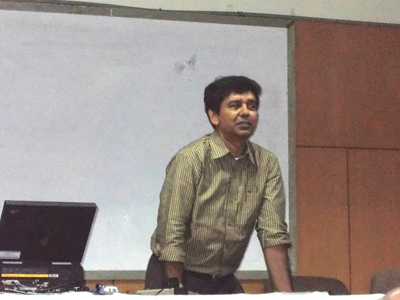 November 8, 2011, Tuesday, Jadavpur University, Kolkata, India. 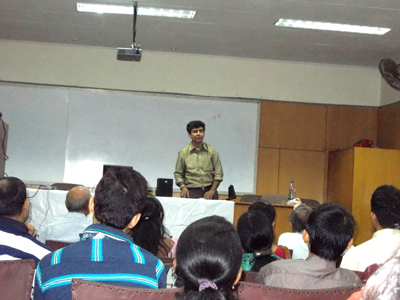 This date was recorded as the day when first lecture on laser animation course was given by Manick Sorcar. The Seminar Room at the Electrical Engineering Department where the session took place was packed with laser animation enthusiasts. Among the teachers were Prof. Saswati Mazumdar, Dr. Biswanath Roy, Mr. Suddhasatwa Chakraborty, Mrs. Kamalika Ghosh, and post graduate and under graduate students, research scholars, laboratory technicians, staff etc. The speech topic was “Laser Lighting for Art, Animation and Entertainment”, which also happened to be the name of the book used as a text in the class, written by Manick Sorcar. He opened his book, read all the names of the nine Chapters and briefly explained their objectives. Manick explained Laser animation is a combination of science and art. The science part of it can be very easily handled by the technical students. For art part, one does not have to be a skilled artist, but needs imagination and wake up the artistry that lies within every human being. Regarding the technical side, he explained how the narrow but strong beam of directional, monochromatic, coherent light can be programmed to race along a drawn path to give the optical illusion of a still graphic or moving animation with the help of a series of new lighting equipment such as the galvos, X-Y scanners, PCAOMs (Poly Chromatic Acousto Optic Modulators), shutters, actuators etc. He explained that Laser art is not a standard computer graphic like they are seen on a monitor or TV, or an image that is projected on a screen from a slide show. Laser art is actually a line drawing without any fill color, sketched on the computer as a series of electronic points, which a single beam of laser follows to connect the dots to give the optical illusion of a complete image on the screen. In reality the single beam is stationary. With the help of the computer, two tiny mirrors are programmed to move the reflection of the beam very fast - one on X-axis and the other on Y-axis, precisely following the point-path of the drawn image. For a flat drawing it is projected on a screen; for mid-air 3-D patterns or atmospheric it is aimed in space above the audience. He explained how a still image is drawn with Laser filtering all unwanted lines, and how a series of images must be drawn by hand or computer to create an animated movement based on the traditional principles of animation. “This animation class is exciting to me as much as it is to you”, said Manick, “after I have taught you how to do laser animation, I will take your help in building the storyboard and part of the animation on my father for which I am building a laser show to celebrate his birth centenary in 2013". The session ran for almost two hours with a short coffee break, before it was adjourned.